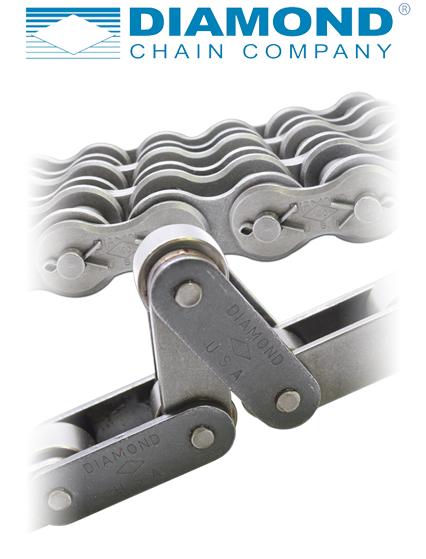 Diamond Chain Company is an American company with a worldwide reputation for its specialised roller chain product range. We are proud to be the exclusive distributor for Diamond AG Chain in the UK. This is a specialised lubricated chain with solid bushes specifically for the agricultural market, however we are able to supply other products from their extensive range. Diamond Chain are renowned for the longevity that they provide and the reliability in performance giving excellent return on investments and confidence. Each Diamond Chain goes through rigorous production processes to ensure reliability and proven performance is achieved on each product. In addition to the agricultural market Diamond Chain are also suitable to use in other industries such as oil and gas, material handling, paper and pulp, mining, aggregates and food production.